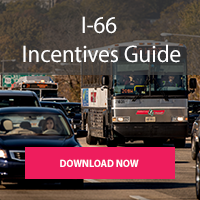 The I-66 corridor now operates strictly as express lanes during peak travel hours and these changes may impact your employees and your business. 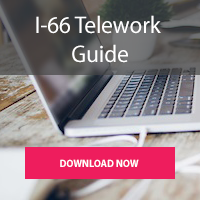 Arlington Transportation Partners (ATP) can assist your company or property in understanding the dynamic tolls, resulting in your employees and tenants learning the best way to travel I-66 inside the beltway. Similar to I-95 express lanes, I-66 operate under dynamic tolling with no max toll. All drivers must have an E-ZPass mounted in the car to use the express lanes. When a toll is dynamic, the fee to use the lanes is adjusted to volume on the roads and demand for the lanes. The suggested toll aims to maintain a free-flow speed of 45 mph; drivers will see two pricing signs before committing to the express lanes. Once a driver enters the lane, a price is locked in place. The lanes will be free for all users during off-peak periods, including weekends and holidays. E-ZPass transponders are available at Arlington County Commuter Stores, DMV, AAA, and at some grocery stores. Purchase price is $35, with $15 available for immediate use; the remaining balance is available to use after a driver registers the transponder. Visit ezpassva.com or call 877.762.7824. Standard – best option if you are most likely to drive alone. *There is a fee if you do not use your flex within the first six months. All drivers must have an E-ZPass mounted in the car to use the I-66 express lanes. There are also new rules for special types of road users. See below for what has changed to see if you are affected.